Upon a generous invitation of dear friends several years ago, my wife and I spent a relaxing week on Liberty Bay in the tiny town of Keyport, Washington. While there I was inspired to compose this lazy little ragtime tune and it became a constant soundtrack to our musings on the porch of the bay side cottage we were living in. Taking walks around the town, I had the melody of this little tune running through my head and I would frequently head back to the cottage to pick up my ukulele and try out new ideas that would pop into my brain. 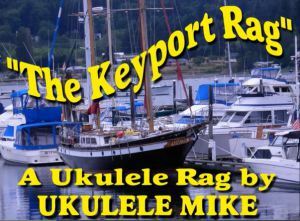 KEYPORT RAG is largely played in a swinging, bouncy travis picking style and below is a small example of the tablature arrangement of this song.